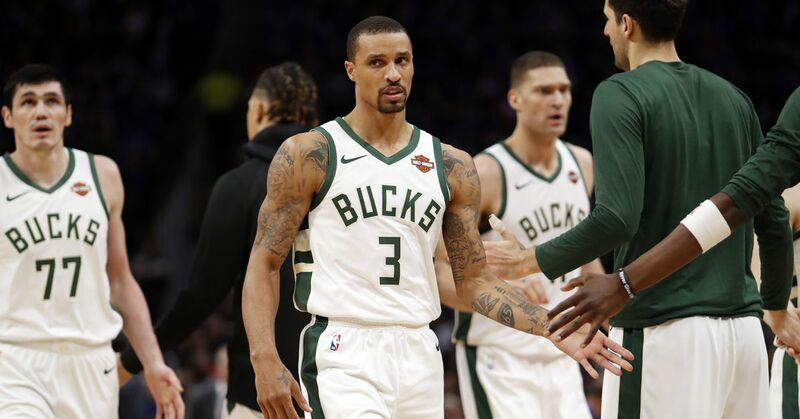 The Milwaukee Bucks moved to 4-0 under interim head coach Joe Prunty after beating the Philadelphia 76ers 107-95 on Monday night at BMO Harris Bradley Center. Giannis Antetokounmpo posted a double-double (31 points, 18 rebounds) and added six assists in the victory. Hours removed from earning the Eastern Conference Player of the Week award, Khris Middleton had 19 points on 7-of-19 shooting. Dario Saric finished as Philadelphia's leading scorer (19 points), and Ben Simmons chipped in with 16 points. Saric was a rebound shy of his ninth double-double this season. Eric Bledsoe was listed as probable earlier today with left ankle soreness. As of right now he's still considered to be available but that left ankle could be playing a role in his absence. For now, he's on the bench. Parker had just started to scratch his NBA ceiling last year when he averaged 20.1 points and 6.2 rebounds and shot 36.5 percent from the perimeter in his first 51 games before tearing his ACL. Still only 22, Parker could be a big difference-maker for Milwaukee in the second half of the regular season. The Sixers were without Joel Embiid after he played 36 minutes in the team's 122-112 defeat to the Oklahoma City Thunder on Sunday night. According to NBC Sports Philadelphia's Jessica Camerato, the Sixers cited a medical restriction and "load management" as the reasons for Embiid's absence Monday. Philadelphia struggled mightily in the first half without its leading scorer. Although the Sixers trailed by only two points, 53-55, through the first two quarters, they were 0-of-15 from beyond the arc. Saric and Robert Covington were the biggest culprits, as each player missed five three-point attempts. Despite Philadelphia continuing to find success inside, it couldn't cancel out the team's inability to consistently knock down long jumpers. The Sixers' deficit climbed to eight points, 75-83, to end the third quarter. The Bucks largely put the game out of reach for good when Antetokounmpo hit a three-pointer with 4:49 remaining in the game and Matthew Dellavedova quickly followed up with a right-handed finger roll to put Milwaukee ahead by 15, 100-85. The Bucks have what will be a tricky matchup on the road against the Minnesota Timberwolves on Thursday, but most fans will be looking ahead to Friday. Getting Parker back on the court is essentially like executing a midseason trade. The fourth-year forward will obviously need some time to get back in game shape, but he could help push Milwaukee into the top four of the Eastern Conference. The Sixers, meanwhile, have Tuesday night off before returning to the court Wednesday against the Brooklyn Nets, which will be the end of their four-game road trip. Philadelphia will then open up February with a home game against the Miami Heat and a road game with the Indiana Pacers on a back-to-back starting Friday before beginning a well-earned five-game homestand Feb. 6.